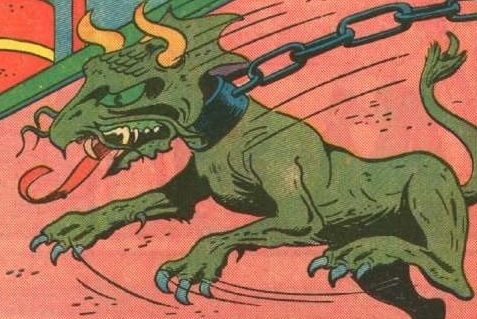 This week's beast isn't based on a cheap plastic monster...I'm gonna pull the next few from public domain comics instead (this critter comes from the Flint Baker story in Planet Comics #1...larger pic is at the end). It still gets thrown into the horrific pits of the underground beastfights, however. The Biceratung does not show the same fear of people displayed by many beasts, leading some scholars to believe that those found in the wild are actually feral descendants of a once-domesticated species. Biceratungs are often chained to be used as guards; many people find their odor to be just as unpleasant as their demeanor. Due to the nature of their acidic saliva, chains used to hold a Biceratung must be specially coated to avoid corrosion. 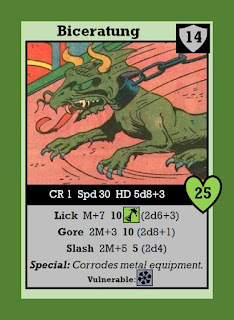 When a Biceratung hits with its Lick attack, metal armor worn by the defender takes a permanent -1 penalty to the AC bonus it grants. These penalties are only cumulative to a total of -2; however, unless the armor is thoroughly cleaned or magically protected from further damage, an additional -1 penalty will be added every 24 hours. 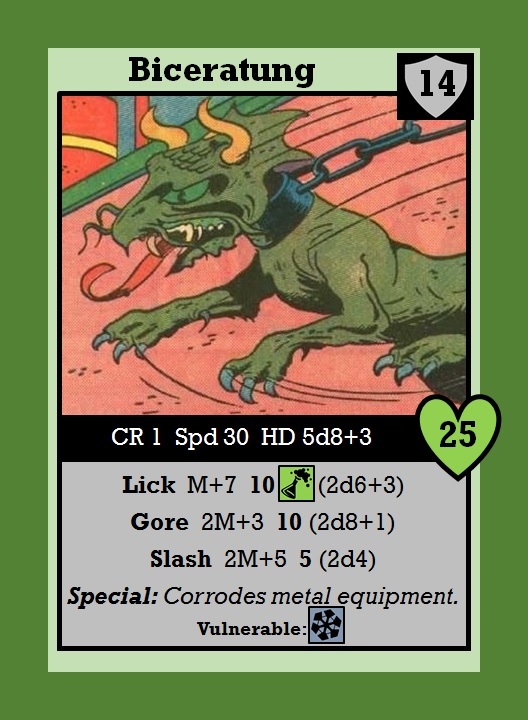 When a Biceratung misses with its Lick attack, any metal weapons wielded by the defender have a 50% chance of facing similar corrosion, with the penalties applied to the damage dealt by the weapon. Armor or weapons are destroyed if the penalty reaches -5.